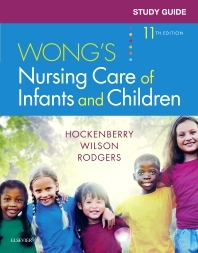 Corresponding chapter by chapter to the completely reorganized and revised Wong's Nursing Care of Infants and Children, 11th Edition, this study guide helps you apply pediatric nursing concepts to real-world practice. It assesses, reinforces, and strengthens your understanding of pediatric nursing with learning activities, review questions, and case studies with critical thinking questions. Learning Key Terms — consisting of matching and fill-in-the-blank questions — test your ability to define all key terms highlighted in each textbook chapter. An answer key for the review questions and learning activities is included in the back of the study guide. Pages are perforated, so submitting assignments is easy. Reviewing Key Concepts and Content includes questions in various formats to provide you ample opportunity to assess your knowledge and comprehension of information covered in the text. Activities include matching, fill-in-the-blank, true/false, short answer, and multiple choice to help you identify the core content of the chapter — and test your understanding upon completion of reading the chapter. Learning Key Terms consists of matching and fill-in-the-blank questions that let you test your ability to define all key terms highlighted in the corresponding textbook chapter. An answer key is included at the end of the Study Guide. Perforated pages allow you to submit assignments to your instructor.